Thomas Carlyle, renowned nineteenth-century essayist and social critic, came to be thought of as a secular prophet by many of his readers and as the "undoubted head of English letters" by Ralph Waldo Emerson. Historical Essays brings together Carlyle's essays on history and historical subjects in a fully annotated modern edition for the first time. These essays, which were originally collected in Critical and Miscellaneous Essays, span Carlyle's career from 1830 to 1875 and represent a major facet of his writings. 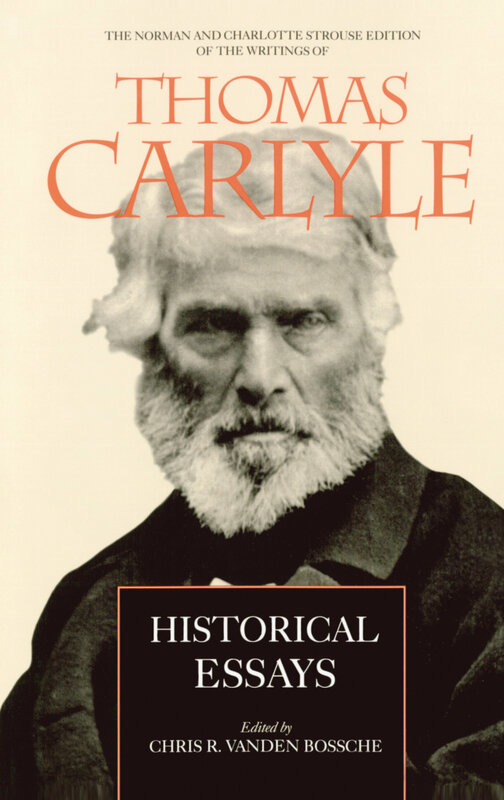 This edition uses all the extant authoritative versions of the essays to create an accurate critical text and includes a mine of lucidly presented information to enhance readers' understanding of Carlyle's densely allusive prose. The collection includes essays on the French Revolution, Cromwell, Frederick the Great, and medieval Scandinavia. It also includes such essential pieces as "On History," "On History Again," "Count Cagliostro," and "The Diamond Necklace." Together the essays show Carlyle positioning himself in relation to the new Romantic historiography but not yet ready to adopt the strictures of modern scientific history. They also exhibit his talent for analyzing the historical significance of seemingly minor events. He describes a plot to steal a diamond necklace in which Marie Antoinette became implicated, a visit of Whig sympathizers to the National Assembly during the French Revolution, and the kidnapping of two fifteenth-century German princes, one of whose descendents was Carlyle’s contemporary Prince Albert. This volume, the third of the eight-volume Strouse Edition of Carlyle’s works, includes a historical introduction and illustrations along with complete textual apparatus. Chris R. Vanden Bossche is Professor of English at the University of Notre Dame and author of Carlyle and the Search for Authority (1991).